In the last week, we’ve had a few big updates on the political content and digital advertising front so we thought now would be a good time for a post with the information. There have been changes to both Twitter and Facebook to improve their transparency and ensure that it’s clear who or what is posting political content. The 3 choices are: “organization registered with the FEC” (which I would think means candidate or PAC but they haven’t actually said that explicitly). “organization not registered with the FEC” (see below for the list of unanswered questions this highlights) or “individual”. For non-FEC registered organizations and individuals you will need to download a form, get it signed in front of a notary then upload the form AND a copy of your US Passport. Which leads to all the unanswered questions…most of which I have tried to ask via email and via Twitter with no response as of the posting of this note- if I get answers I will update this post. What if someone doesn’t have a passport? Why isn’t a state drivers license or state id usable? And what about undocumented Americans? Under account requirements, the disclaimer requirement raises the question of the handle name and relation to advertiser and consultants…the handle is owned by the client and everything associated with the account is owned by the client but it’s the consultant running the ad so is the disclaimer in the bio necessary in this instance? What is the drop-dead date for getting verified? In a related update, Twitter has also re-announced the new Election Labels for not just political ads but also for organic content from candidates for US House, US Senate or Governor. Other candidates will eventually also be subject to this but not at first. These labels will start to appear Wednesday, May 30. Thursday, Facebook publicly revealed the new political ads archive. The archive is searchable for any and all ads launched since May 7 and going forward with the ads held in the archive for 7 years. 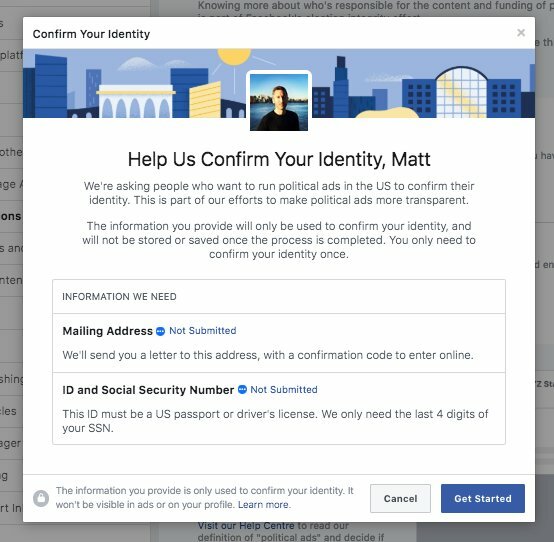 Additionally, last week Facebook began enforcing advertiser verification rules, meaning if you are not yet verified you will not be able to run political ads and if you were running ads when enforcement started your ads likely got turned off. Note: I’m finding this to be pretty buggy as I am verified, I have associated myself with the pages I run ads from and have been checking the political ad box yet ads are getting rejected even in the ads process. Those are the most recent updates. This post was originally published as a Facebook Note by Becker Digital Strategies. Another post will be made as Beth gets answers or new announcements are made.